Revolutionizing Project-Based Learning Project-based learning is a top priority at PS 15 Patrick F. Daly School of the Arts. Located in Red Hook, Brooklyn, this public school relies on creative and academic projects to lead students through concepts that are aligned with the national Common Core Learning Standards, in addition to local and state standards. Through a federally-funded Magnet Grant, STEM Educator Jenna Utter found a unique way to add a fresh sense of innovation, creativity, and fun to her classroom. The Challenge If you ask any teacher, they’ll tell you one of the biggest challenges is keeping students engaged. Children become used to traditional learning techniques, and even projects aren’t always enough to excite them. Utter was always on the quest for new tools and resources that will work to keep students focused. She needed to find a powerful way to make STEM learning interactive, interesting, and fun. Since PS 15 relies on public funding, the administration doesn’t have the budget to spend on anything outside of the usual list of resources. Knowing that more materials were needed to truly optimize classroom learning, the school applied for a grant through the Magnet Schools Assistance Program. The Solution In 2015, PS 15 was awarded with three years of funding from the Magnet Grant. The money gives educators the means they need to get more creative in the classroom. Utter finally had the opportunity to enhance her lesson plan with what would finally keep the students immersed in the learning process: a Makerspace in the classroom. Within Utter’s Makerspace are three compact MakerBot® Replicator® Mini Desktop 3D Printers, one MakerBot Replicator Desktop 3D Printer (Fifth Generation), and one MakerBot Replicator 2 Desktop 3D Printer. She allows grades 2 through 5 to create their own projects with them. The printers are a great tool for the classroom, as students are able to incorporate all areas of STEM into designing, modeling, and completing their print. Inspiring Teamwork and Collaboration Utter begins by taking a larger STEM lesson and uses it to create a 3D print challenge that students will enjoy. She breaks the class up into teams of six. The students collaborate to sketch and design a print that expands on the lesson. They then partner up to model their designs on Tinkercad to where one is controlling the computer and one is talking about what should be done. “It’s good for grouping, especially if one kid is higher level and one kid is lower level. You make the kid that’s higher level do the guiding and the kid that’s lower level do the driving. It’s a really great learning opportunity for the kid that needs more guidance,” Utter says. Students are then able to test their prints. This keeps students on the edge of their seats, excited to see the outcome of their 3D design. Assessing Success As far as grading goes, Utter observes how students are applying the STEM lesson towards their 3D prints and designs. “There certainly aren’t any 3D printing standards, so there always has to be some sort of application to the content that they have to know in order to justify using it,” she says. If she sees that they’ve used their 3D modeling and design work in a way that reinforces what’s in her lessons, that means that they’ve used their 3D printers successfully. This is what will land them a good grade. “FAIL Forward,” is a phrase that’s proudly displayed on a poster in Utter’s classroom. Everyday, the students look up to see FAIL being defined as the “First Attempt In Learning.” This acronym is a liberating take on the process of iteration, as students are reminded that a flawless achievement is something that you might not always get on the first try. It lets them know that success lies in moving forward and learning from mistakes. Utter’s Makerspace is a safe zone where students experience the trials and errors of iteration firsthand. Throughout the process of 3D modeling, students usually have to go through several iterations, adjusting and refining before finalizing their work. Learning in this way is just as important as the final result. A student’s effort and approach to iteration is something that Utter considers when grading them. Empowered by the flexibility of 3D printing, Utter views her printers as powerful resources in her classroom. When describing how her Makerspace fits into her lesson plan, she says, “the roadmap towards learning becomes whatever I want it to be, because I get to incorporate other disciplines.” Students mix areas of STEM content during the print process without even realizing it. With the right 3D printing challenge, a math lesson could quickly turn into an engineering feat. A 3D printing project expanding on a technology lesson might need specific math formulas to get the design right. In this way, educators are able to combine and blend multiple content areas, while still reinforcing the main lesson. Utter has full reign on where she’d like her students to go with these 3D printing challenges. 3D Print Project Highlights SECOND GRADE 3D printing gave Utter’s second graders a fun way to expand on their geography lessons. After studying fast land changes, the class creates structures in Tinkercad that would be able to withstand earthquake simulations. Students both had to consider geography and basic engineering concepts for their design. THIRD GRADE The same sort of multi-faceted learning approach can be seen in her third grade class’ exploration of simple machines. Utter had her students make cars to teach how force can be used to create motion in machines. The cars, which used a rubber band wind-up system to generate movement, relied on 3D printed parts. Not only did this cut the cost of having to buy pieces, but students were able to explore the science of potential energy by engineering and designing parts to get their cars moving. Very often, 3D-printed projects also become keepsakes for the students to enjoy. A popular project for her third graders was creating personalized name keychains, which helped reinforce the concepts of positive and negative space. “The keychain’s hole is the negative space. For positive space, they work with layering. So, the letters in their names are layered to rise above the level of the bar,” Utter explained. “And then it’s personal, which they love. And it’s pretty fast to print.” FOURTH GRADE After her class studied circuitry, Utter had her students create 3D-printed LED pins that they could attach to clothes and backpacks. “They had to complete the circuits to make the light work,” she says. The students designed their own shapes for the pins, which led to the creation of pieces that were colorful, creative, and fun. FIFTH GRADE Since her fifth graders are her oldest students, Utter decided to assign a more high level project. “I wanted to expose them to a career and incorporate all the areas of STEM,” she says. In partnership with Nelligan White, a local architecture firm, the students completed a project where they designed new benches for the school’s courtyard. A team of six architects visited once a week to help them through the process. “They drew the designs at different angles, and then the architects helped us by rendering them in the 3D modeling software, and we printed them.” The 3D prototypes helped the students judge which bench model would work best in their courtyard space. “They learned about color, color balance, design elements,” Utter recounts. Most of all, students learned how to design and make decisions within a budget, just as they would in a real world job. Encouraging Student Creativity, Entrepreneurship, and Innovation 3D printing redefines what’s possible for Utter’s students. Being able to enjoy the creative process makes all the hard work worth it for them. “It’s very challenging sometimes, but it’s also fun in a way. It feels really rewarding when your thing gets printed and you get to take it home. It’s fun,” says Amiya Herrera, a fifth grader in Utter’s class. Other students can already visualize how 3D printing can be useful in their future careers. When discussing her dreams of becoming a veterinarian, Rose Hochkeepel says, “I would like to make models to help people understand what’s going on. I could make 3D prints of an illness or a body part and give it to pet owners so that they could better understand what’s happening to their pet.” Xavier Wichard, who wants to be a chef, wants to design his own restaurant using custom 3D models. Amiya Herrera, a future Young Adult fiction novelist, is looking forward to 3D printing figurines of characters from her books. A New Dimension for Learning Long after the kids leave to go home for the day, the gentle whirring of 3D printers can still be heard in the back of the classroom, working to create a physical piece of each student’s imagination. In the morning, they’re excited to go to the Makerspace to see what they’ve created. These moments are the ones that blur the lines between learning and fun. Project-based learning is made easy and engaging through the convenience and flexibility of a classroom Makerspace. Jenna Utter’s students are among a population of kids across the world that are being challenged, inspired, and motivated by the accessibility of 3D printing. 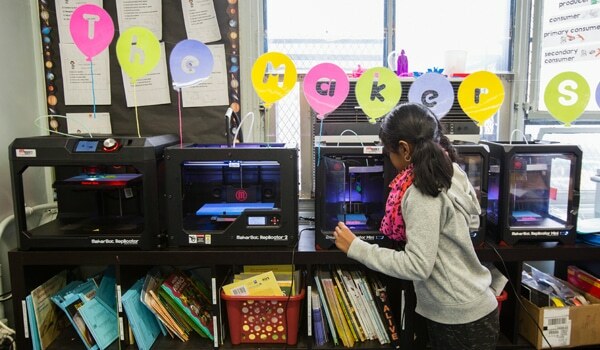 With MakerBot in the classroom, learning is reinforced, and students are equipped with the skills they need to truly succeed in the careers of the future.